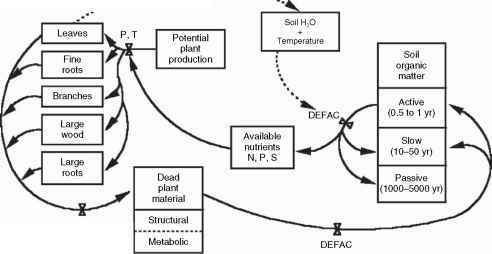 Figure 3 Patterns of herbivory, and implications on the size of the producer biomass pool, observed across a broad range of ecosystems. Pool of producer detritus Low High herbivore type and size, feeding specificity, migratory behavior, and intensity of predation on herbivores. The relationship described above suggests important consequences for trophic functioning and elemental cycling. By removing a larger percentage of gross primary production, aquatic herbivores should exert greater control of producer biomass than their terrestrial counterparts. On this basis, it can also be expected that ecosystems with highly nutritional producers will tend to have relatively small pools of producer biomass compared to ecosystems with similar values of gross primary production but of poorer nutritional quality. Finally, herbivores in nutritionally rich ecosystems have a greater impact on elemental recycling in ecosystems with richer producers since a larger fraction of producer biomass passes through herbivores before being recycled back into inorganic nutrient pools. In contrast, when herbivory is expressed as an absolute flux (i.e., quantity of producer biomass consumed per unit area per unit time), consumption rates do not increase with primary producer N and P content when examined over a broad range of ecosystems (Figure 3). 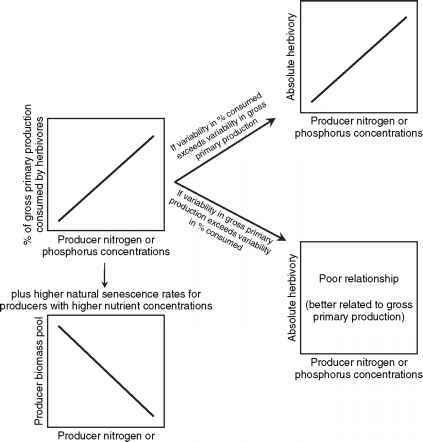 In part, this relationship results from the poor relationship between gross primary production and N and P concentrations when analyzed over a broad range of ecosystems. This may seem counterintuitive until one considers the suite of environmental factors known to influence gross primary production (e.g., temperature, humidity, and soil redox conditions among others). Differences in the relationship between relative (percentage) and absolute herbivory rates and ambient food quality are also an artifact of broad variation in primary production rates. Primary production rates can vary by several orders of magnitude. Therefore, even modest relative consumption rates (percentage of production consumed) like those expected under low-nutrient content can result in large absolute values of herbivory. That is, the relationship between primary production and absolute herbivory rates trumps the relationship between food N and P content and relative herbivory rates. Interestingly, relative herbivore production (i.e., ratio of herbivore biomass produced per unit of producer biomass ingested) does not appear to vary systematically among ecosystems.